ANN ARBOR, Mich. - Aug. 24, 2018 - PRLog -- The Michigan Trails and Greenways Alliance hosted a kayak outing in the Trail Town of Ann Arbor yesterday from the Argo Cascades to Gallup Park to highlight the importance of water trails to our cities and people. The event was presented in conjunction with the Huron River Watershed Council and made possible through the generous sponsorship of water trail supporters like the Michigan Restaurant Association, the Land and Information Access Association and the National Federation of Independent Businesses. Participants ended their journey down one of the state's most popular waterways for non-motorized recreation with a keynote speech by Jon W. Allan, Director of the Michigan Office of the Great Lakes over lunch at Trail Town supporter the Jolly Pumpkin. Bob Wilson, Executive Director of Michigan Trails, explained the 2nd annual event was designed to celebrate Michigan's greatest natural resource--its waters and the incredible network of local water trails that we have in Michigan. The outing along the Huron River showcased one of the state's federally designated water trails and 18th water trail in the nation. 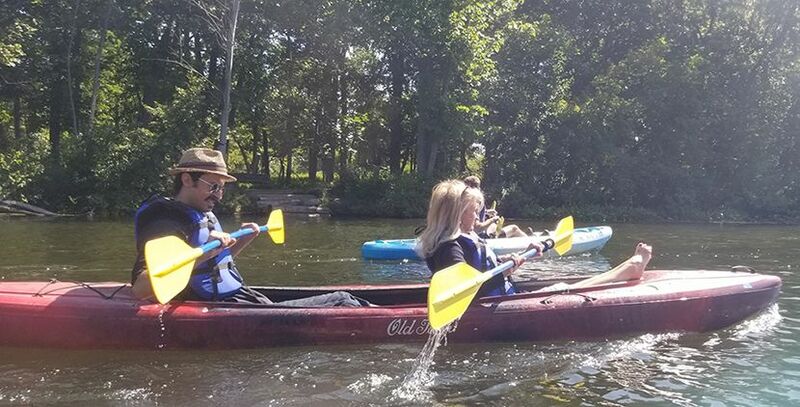 "As you kayak the Huron River today, think about the impact a state-designated water trail can have on your community and district," said Wilson. "Just as we are enjoying Michigan's natural resources and bringing our commerce to a restaurant on the river that's what our residents and tourists will be able to do!" Laura Rubin, Executive Director of the Huron River Watershed Council added her organization is the oldest regional watershed council working to protect and restore the watershed. "The City of Ann Arbor canoe and kayak liveries are the busiest in the state thanks, in part to the success of our work to complete the Argo Cascades," Rubin explained. "We have five other liveries serving the river up and down the system, and 2.6 million recreational visitor days a year, with $53.5 million in annual economic output. The city alone makes over $1 million/year through the liveries." The ability for water trails to generate commerce for our Trail Towns like Ann Arbor is just one reason to continue to grow Michigan's presence within the water trails universe, Jon Allan advised over lunch. "Water trails and the relationship a community has with them and its people is transformational, said Allan. "A community can restore itself through its water. That's why since 2012 the Office of the Great Lakes through the Coastal Zone Management Act has provided $1.8 million for development at the local level to help communities build relationships with their waterfront." Michigan has 4,500 miles of designated coastal water trails but Michigan Trails would like to see these trails expanded to our many inland rivers and lakes. "We believe as trails connect, people connect, and as people connect you knit them together," said Allan.